Religion was important to the ancient Greeks because they believed that it would make their lives better while they were living. They also believed the gods would take care of them when they died. The Greeks believed that gods and goddesses watched over them. The gods were like humans, but immortal (they lived for ever) and much more powerful. A family of gods and goddesses lived in a cloud-palace above Mount Olympus, the highest mountain in Greece The gods looked down to watch what people were doing, and from time to time, interfered with what went on. The gods did not always behave very well. Their king, Zeus, was always being unfaithful to his wife Hera. He appeared on Earth as a human or an animal to trick women he had fallen in love with. The Ancient Greeks believed that all the gods came from Gaia (the Earth) and Uranos (the sky).They thought they were like adult humans - always falling in love, arguing, having children, playing music and partying. Like the Romans, the Greeks believed that different gods were responsible for different things. 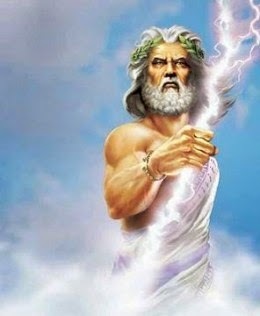 Zeus was the king of the gods. He could control the weather. The ancient Greek poet, Hesiod, called him the 'cloud-gatherer' and the 'thunderer'. His most powerful weapon was the thunderbolt. The ancient Greeks believed that when lightning struck earth, it was a sign of Zeus being present. Zeus was also concerned with hospitality. If you treated a guest or stranger badly you could outrage Zeus. He was made lord of the underworld, ruling over the dead. He is a greedy god who is greatly concerned with increasing his subjects. Those whose calling increase the number of dead were seen favorably by him. He was also the god of wealth, due to the precious metals mined from the earth. His wife was Persephone whom Hades abducted. He is great great olympian of greek. Brother of Zeus. The God of the sea and worshiped by seamen. He married Amphitrite. His weapon is a trident, which can shake the earth, and shatter any object. He is second most powerful god. Goddess of corn and the harvest. She taught mankind the art of sowing and ploughing so they could end their nomadic existence. She was of a severe, a beauty scarcely relieved by her hair. which was as fair as ripened grain. Poseidon coveted her, but Demeter refused herself to him. To escape him she fled to Arkadia where, assuming the shape of a mare, she mingled with the herds of King Oncus. Poseidon, however, succeeded in finding her, changed himself into a stallion and made her the mother of the horse Arion. Ares was the great olympian god of war. He possessed very few temples and shrines in the ancient world, but was apparently honoured with rites in times of war. His cult seems to have been centred on the northern regions of Greece--Thessaly, Thesprotia and Thrake. However, there are no descriptions of these regions comparable in detail to Pausanias' account of the Peloponnese which might shed light on the cult of Ares in the north.